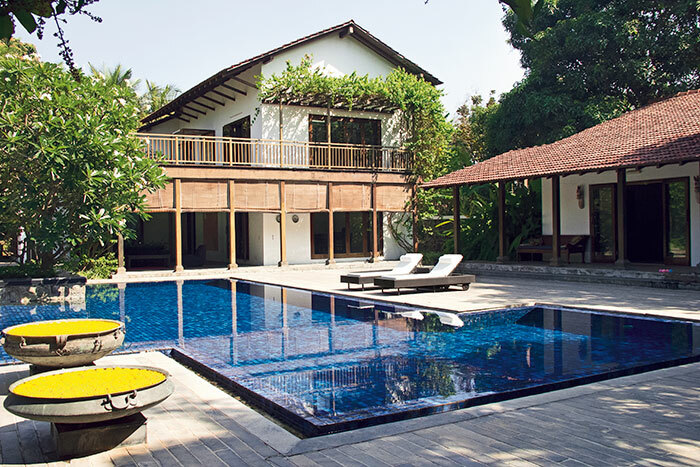 Set in a village called Zalkhand, in Alibaug, artist and fashion designer Payal Khandwala’s family home is an exercise in countryside aestheticism and controlled contrasts. The winsome green and welcoming entrance that takes me to the house is a short walk amidst an array of trees, leading to an open space which overlooks a plush lawn, a glass gazebo, a swimming pool, and of course, the breathtaking weekend home that draws you in with the first look, making it the epitome of a new age never-never land. The architecture exudes a rustic chic feel, while the interiors render a raw aesthetic to the ambience. “We wanted to keep it simple and local, and that is what formed our choices in terms of the material and landscape preferences. Another important factor was the villa’s location, which is in the middle of the village. 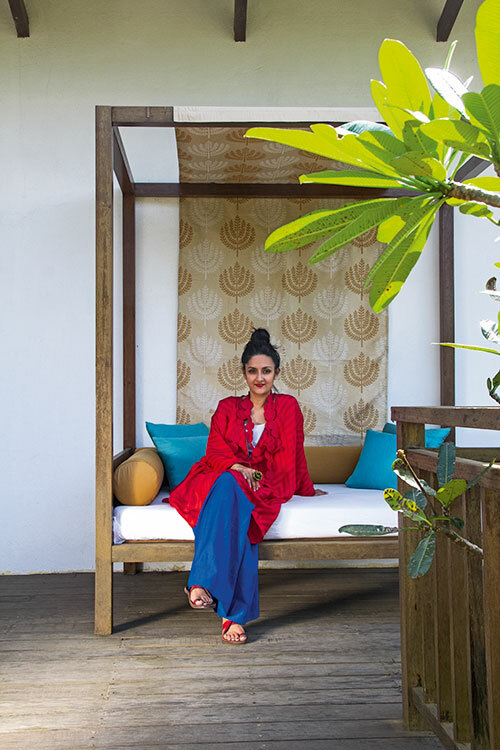 We wanted to blend the home with the surroundings,” says Payal. “The land was a dense forest space. Keeping this in mind, we did not want to build a singular villa; instead, we have installed a master bedroom, two studio bedrooms and Payal’s personal bedroom in separate villas,” adds architect and interior designer Pallavi Choksi, who has worked with renowned names such as Mckinsey, Vedanta Group, Hiranandani and Kalpataru and is currently a partner with celebrated architect Pinakin Patel. 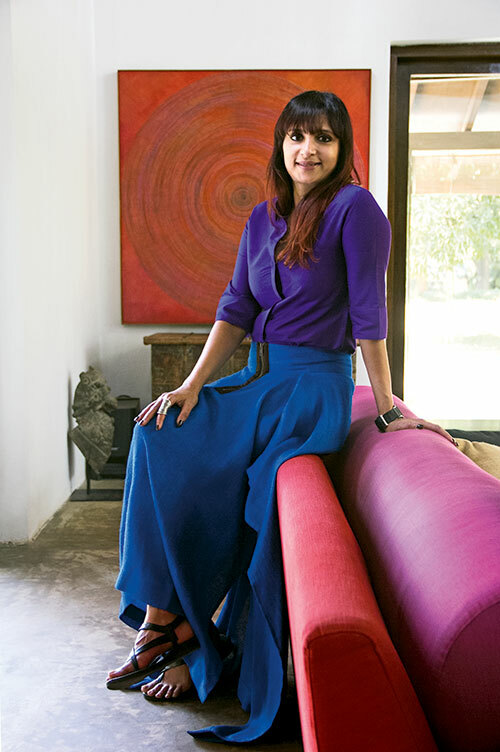 As we’re seated in her living room which is well-ventilated and spacious, with towering walls and glass windows, Payal gives me a mind-tour of the house and her own journey as an artist and designer. “I studied fashion even before I studied art, and ever since the start I have pursued both.” After developing a flair for painting at an early age, Payal went on to study art and fashion at Parsons School of Design, New York. After graduation and a stint in fashion, she decided to take up art full-time. “In addition to painting, I used to make clothes for my daughter. This led to friends wanting me to make something for them and gradually, the hobby turned into a profession,” she says. What’s wonderful about the home is consistency of the ideas which reflects in every room. Separate villas add value to the space, making each corner look spacious and urge the resident to indulge in a journey within nature. For example, to get to the bathrooms you would have to pass through a glass corridor which showcases a verdant landscape that comprises a water body or an open shower area. 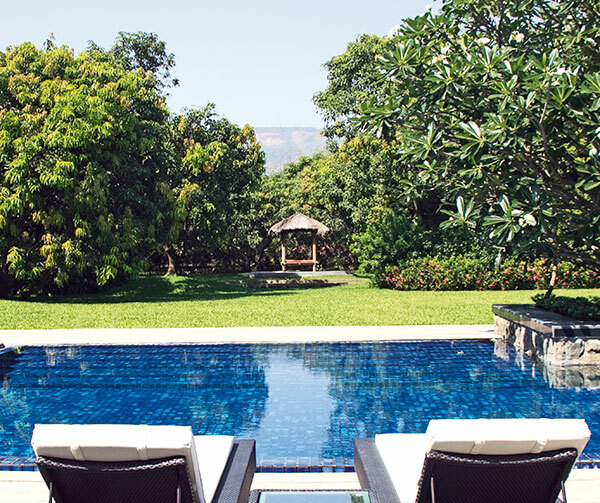 The general idea of the house, Pallavi explains, “was to connect with nature as much as possible. We wanted to make the space look very local. 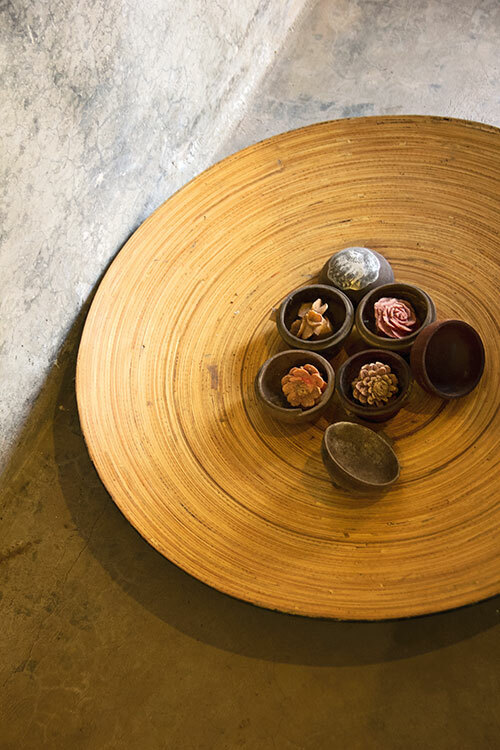 This gave a very vernacular feel to the space, with clay tiles, white walls and local stones used for the flooring to achieve a rugged effect.” All of which comes together to create a tranquil picture that easily unites with nature. When it came to décor, Payal’s strategy was to play along with the architecture and keep things simple yet exquisite; local yet eclectic. “It was relatively quick and easy as I installed many things that I have picked up over the years — be it works of art, furniture or upholstery. 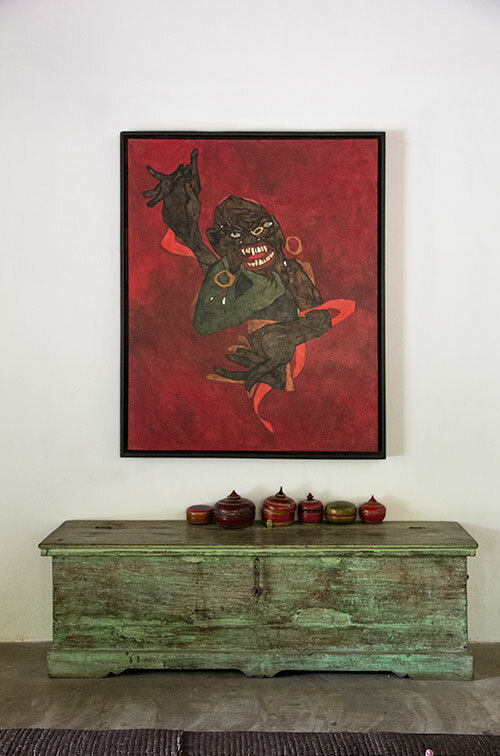 I have also made sure that I keep it minimal and not cluttered since it’s a weekend home.” Walking from one villa to the other, I treat my eyes to Payal’s paintings displayed on the walls which are subject to the mood and the space. “My favourite is the one that I created at school in Barcelona. It is a black-and-white painting which has three shades of black and three shades of white in it. 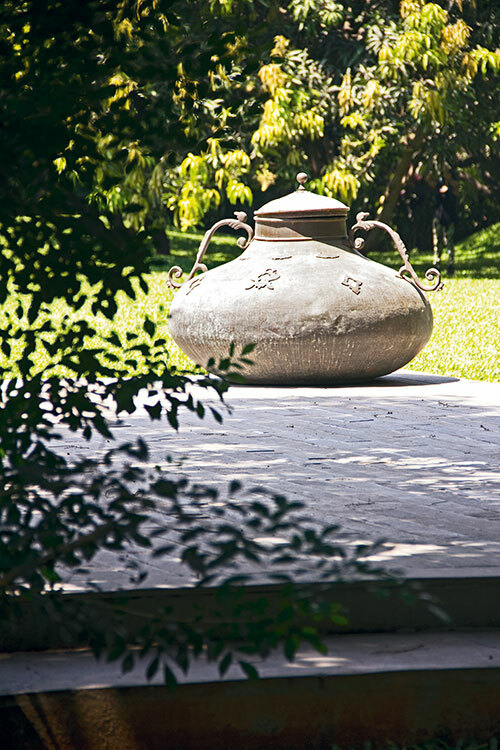 It reflects light differently and is placed in the dining room.” Payal is also planning to install one of her latest buys on the wall, a photograph by Raghu Rai. Once you are comfortable with the surroundings, you realise that this idyllic weekend home is a love affair between space, air and ambience. Pallavi says, “What we have done is purposely kept the furniture low which gives the feeling of a loft-like space with those high ceilings. Upstairs, the mood changes as we enter the master bedroom (Payal’s parents’ room) preceded by her lush bathroom. This section of the house presents an altogether cosy vibe. The bedroom arches out into a bijou terrace; this is the only room that comes with wooden flooring. 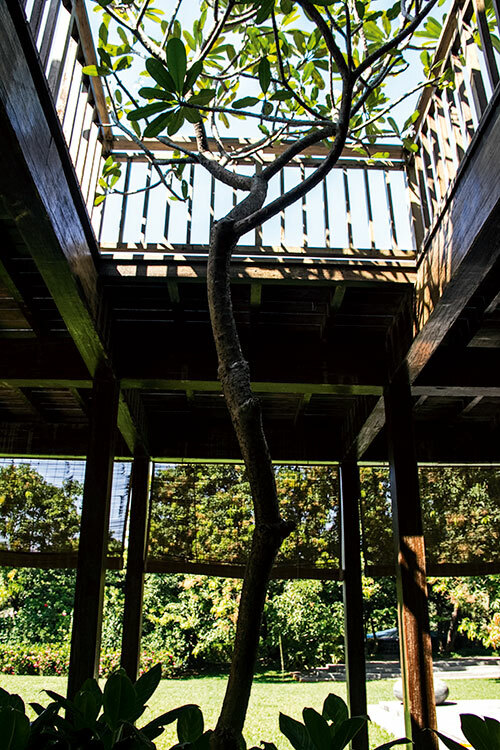 Pallavi points out that “the master bedroom was essentially placed above the living room because the surrounding area has a huge cover of trees. Moving the bedroom to a higher level allows for a much better view as opposed to it being on the ground floor.” This is true, as my eyes easily travel to the farthest mountains and a sense of being surrounded by infinite nature sets in. Symmetry being of utmost importance, the bed is placed centrally in every room, and furnishing remains the same throughout. “The headboard of our bed is cut into the laser patterns that were also on our wedding invitation,” adds Payal as the two ladies acquaint me with the house that was built seven years ago. “The complete interiors of the home took about one-and-a-half years to finish, but sticking to basic textiles and materials made the job a lot easier. The flooring and the furniture in itself is very basic. I’ve kept it very homely and not as a formal space. We have made very personal changes, like painting the bathtub red. There is nothing that has been redesigned, except for the rooms. Since I have a child, we have only moved some odd pieces of furniture or works of art. In fact, the material is the biggest factor — apart from the vast area — that differentiates this house from my Mumbai apartment,” says Payal. 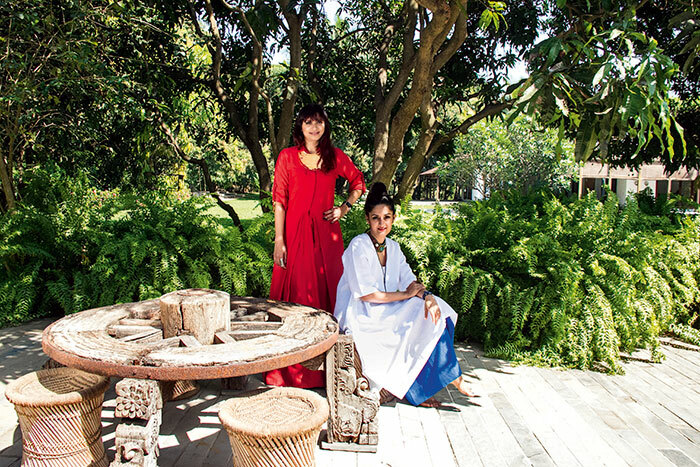 When asked about their favourite spots in the house, Pallavi points to the gazebo that is built in one restful corner of the lawn, whereas Payal adores the bathrooms. “Those places really came together the way I had imagined. Also, the bathroom is the only place where I feel peaceful; it has a little outdoor escape too. That is why we have given a lot of importance to the bath space,” she adds. She makes it a point to spend time here with her family whenever her busy schedule allows her a break, particularly to visit her two dogs, Baghu and Gundi, both of whom have very distinct personalities. Most of the things in-house have been curated by Payal from trips to Chor Bazaar and her travels to Istanbul and Morocco. “I have also kept the textiles simple with plain-coloured cotton-sheets, most of which have been bought and collected from my travels, over a period of time. I love flea markets and tend to find a great place to shop whenever I travel,” adds Payal. As both ladies owe the successful execution of this house to their like-mindedness, one cannot help but admire the strong bond of friendship between them and the effortless synergy which produced this masterpiece.